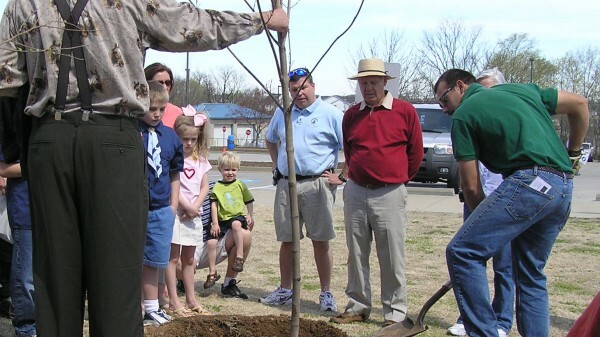 Why Should You Consider Planting Trees? Well-placed shade trees can lower your roof and wall temperatures and help save over 15% on your electrical bills. Shading and cooling and air conditioning unit can increase its efficiency by 10%. Trees can help your property value. Trees add beauty to neighborhoods and can add considerable value to the typical Bowling Green home, which helps to stabilize property values. Trees help clean the air by removing poisonous gases and particulates such adjusts and pollens. They produce vital oxygen for us to breathe and absorb carbon dioxide, one of the so-called “greenhouse gases.” You can visit the i-Tree Design Benefit Calculator to learn more. Trees provide food, nesting sites and protection to the birds, mammals and other wildlife that help fill our lives and our children’s lives with beautiful sights,sounds, diversity and wonderment. What better way to remember a friend? Pick the best spot for your tree according to its cultural requirements. Remove an area of turf at least two to three times the width of the root ball. Step 2: Can You Dig It? Dig the hole with sloping sides as shown in the diagram. The hole should be two to three times the width of the root ball. The hole should be the same depth of the soil in the container or, in the case of a B&B tree, the height of the root ball, never deeper. Remove or cut away the container just before the tree is put in the hole. Be sure to cut any circling roots. Move the tree by the root ball, not the trunk. Minimize the time that the roots are exposed to air and direct sunlight. Remove the wire basket now if the root ball will remain intact. If not, place the tree in the planting hole and remove as much as possible without breaking up the root ball. 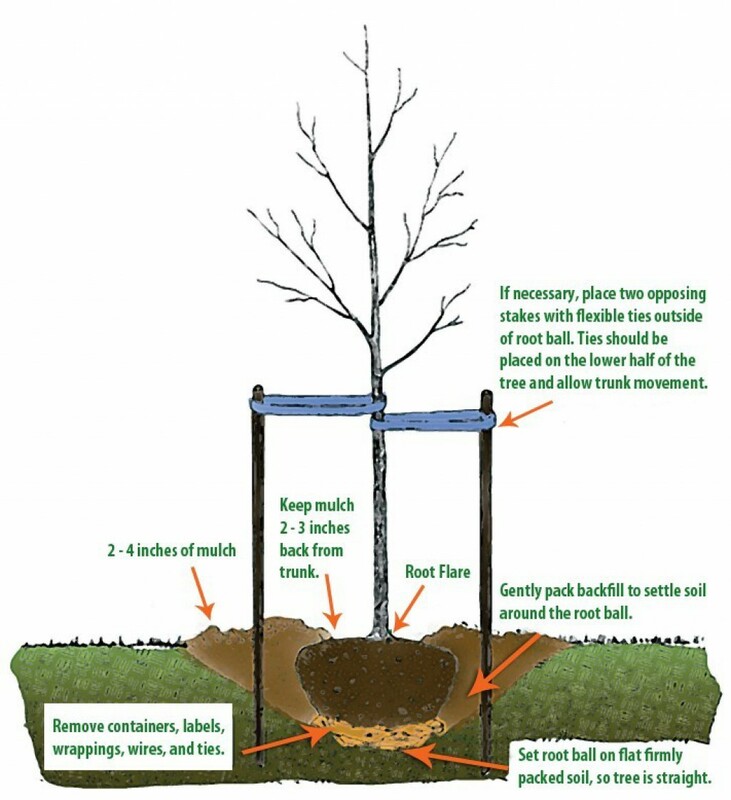 Set the root ball in the hole and adjust it until the 'best' side faces the direction you want and the top of the root ball is about one inch above the surrounding soil level. . A straight stick or shovel handle laid across the hole will help you decide if adjustment is needed. Be careful not to plant too deep! If you have a B&B tree now is the time to cut away any strings from around the trunk and to fold back the top 1/3 of the burlap down into the planting hole. Also remove any tags or labels. Use the soil that you removed from the hole to back-fill around the root ball. If the soil is full of rocks, remove the larger rocks over 2”-3”. Break up any chunks of soil. If the soil is very poor mix it with good topsoil. Do not use other amendments such as peat or compost. When the hole is 2/3 full fill it with water and mix the mud with your shovel to settle the soil and remove any air pockets. Finish back-filling the hole and tamp the soil around the root ball but do not compact it. Put a three inch layer of mulch around the tree. Mulch helps to keep grass out, saves water and keeps lawn equipment such as string trimmers from damaging the thin bark of the young tree. Do not pile mulch up on the tree trunk. Stakes and wide soft ties should be used only when the tree can’t stand by itself. When used this support should be removed after one year or less. Matching the right tree to your site is the most important aspect of tree selection. A tree that is not suited to its planting site will perform poorly, require more maintenance, and ultimately die before its time. How much light does the site receive? What type of Soil are you planting in? Is the area susceptible to Water problems? Is the tree tolerant of pests common to the area? Will the tree tolerate pollution, salt spray? Are there any utilities near? Would the tree affect sidewalks? Would the tree affect buildings? What is the desired function of your tree? Sketch Out Your Plans - First, draw a rough diagram of your lot, including the house and any existing landscaping. Consider The Benefits Of Shading - After completing the diagram of your lot,consider placing your shade trees on the side of the house that receives the most direct sun during the day. Plan For Growth hen Evaluating Locations - Make sure you give your tree adequate room to grow. Try to envision it 5,10, or even 50 years into the future. 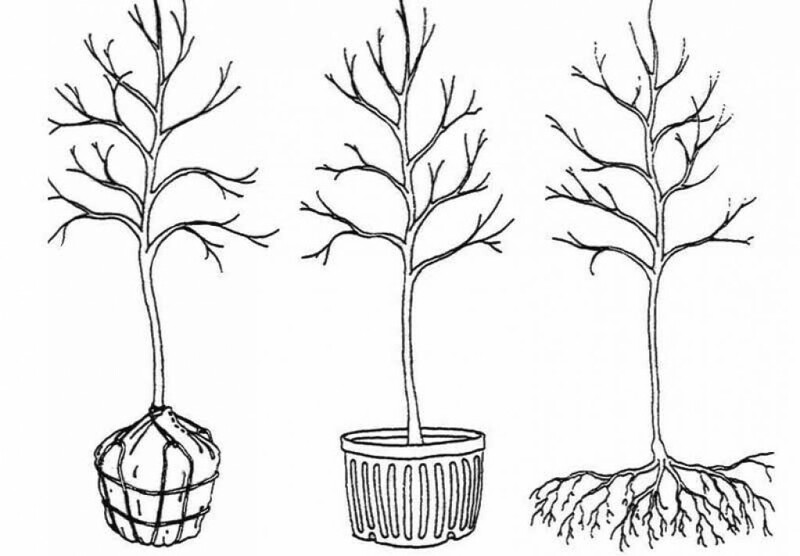 know what a tree will look like at maturity and consider height, crown spread and root space when planting. For reference, the Tree Species Selection Chart lists average mature sizes for recommended trees. Try to locate your tree in a position where it will not split your lot or view into equal halves. To give your lot the appearance of greater depth, plant on a diagonal line outward from the corners of the house. Plant trees on the side or back of your home. Small flowering trees can beautify and accent patios, pools or play areas. Consider the tree’s mature size in relation to overhead and underground utilities. Enclosing the root zone in concrete. Planting tall trees under utility lines. Spreading branches that may tangle with wires or roof leaves. Shading gardens or other desirable sunny spots. Blocking windows or scenic views. Encroaching on your neighbor’s property. Covering traffic signs or blocking views at street corners. Hole should be dug wider and shallower to allow as much as 4 inches of root ball to protrude above surrounding grade. Gradually slope the soil up from the grade to meet the edge of the root ball. Do not dig deeper than necessary, tree needs firm support to keep from settling. Soil removed from hole should be used as backfill, soil amendments have not proven beneficial. Dig planting hole wide enough to allow even distribution and spreading of roots. Remove wire basket ( if present ) completely if the root ball will stay together.